On the left, partisans draw on Christian teaching to pursue social justice, racial and gender equality, and responsibility for the environment. But in order to have a voice within the political left, Christians align themselves with advocates of unrestricted abortion rights, assisted suicide, and those who (naively) seek to remove religious discourse from the public square. On the right, partisans draw on Christian teaching to challenge abortion and to advocate for traditional values. But in order to gain influence with the political right, they routinely align themselves with policies and organizations that obstruct clean air and water legislation, endorse capital punishment, and resist immigration and gun control. When Christians uncritically affiliate themselves with either party, they do so because of political conviction rather than sound theological reflection. It is only through ignorance or duplicity that one can suggest that the Democrats or Republicans genuinely reflect Christian teaching. 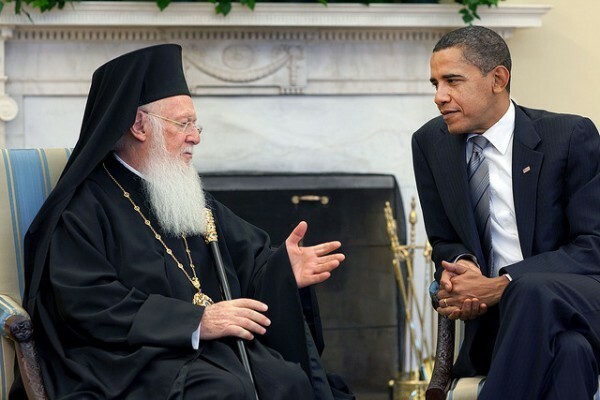 While Orthodox Christians in the United States are just as likely as others to succumb to these false dichotomies, their history might offer a way out of the ideological traps and self-contradictions that dominate current political discourse. In the second century, when Christians first intervened in the public arena, they stressed that their contribution was superior to ordinary Roman citizens because they were motived by faith in God, rather than political advancement. For authors like St. Justin Martyr, Christians sought the public good, for the sake of the good, regardless of whether the state looked favorably upon Christianity. This is a profoundly important insight. Even after the legalization of Christianity, when Christians enjoyed a position of privilege, the most significant theologians of the Church were also those who consistently championed political causes that no ancient government could accept. St. Ambrose censured judges who issued the death penalty, St. Basil excommunicated soldiers who killed in battle, and St. John Chrysostom demanded that the political establishment redistribute its wealth on behalf of impoverished laborers and refugees who had no legal standing. Not only do these issues remain with us today, these interventions bear witness to the fact that the saints did not jettison their moral convictions for the sake of political expediency or predetermined alliances. It was during St. Ambrose’s tenure as bishop that the emperor Theodosius first declared Christianity the official religion of the empire. Theodosius was also responsible for orchestrating the Second Ecumenical Council. But neither endeavor did anything to deter St. Ambrose from repeatedly condemning the emperor for behavior and policies that contravened the Gospel. The political, social, and economic setting of Orthodox Christian history is certainly different than our contemporary context. And, of course, we face a great number of political and social questions for which there is no unambiguous answer from Christian thought or practice. But there are some important lessons from the Orthodox Christian experience that would benefit all American Christians who hope to be active in the public arena. Most importantly, we learn that the engagement in politics should be motivated by a concern for the public good for its own sake. We also learn that the most significant Christian thinkers were those who maintained their moral credibility rather than strike deals with the politically powerful. A politics that entails moral self-contradiction may be expedient, but it can never reflect a genuine Christian politics.